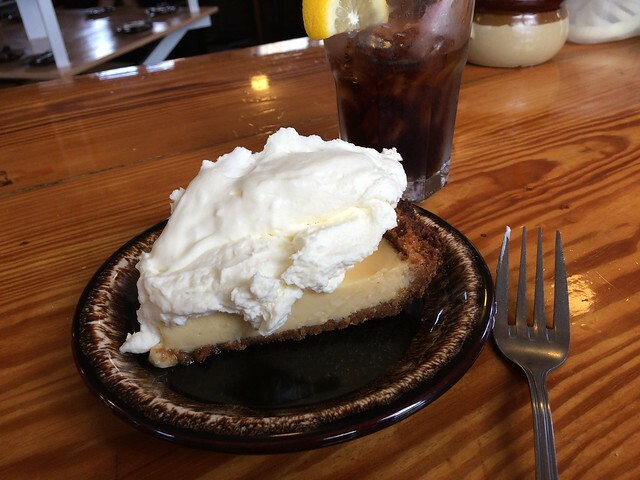 Want Cake By The Ocean – and Pie Too? Holiday Snack Bar, LBI! 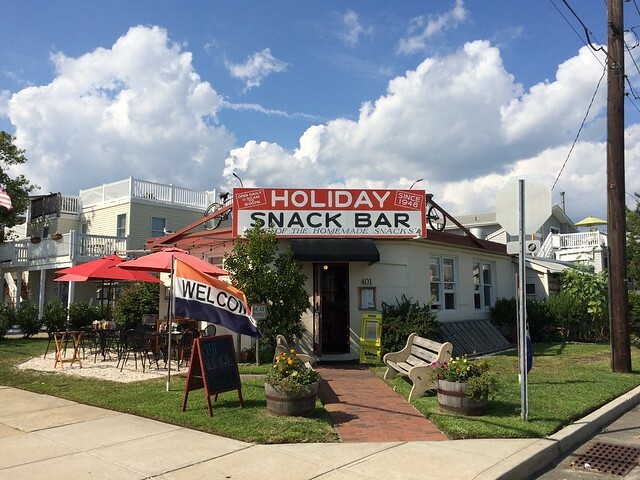 So much more than its snack bar / quick food name implies, the Holiday Snack Bar in Beach Haven, on New Jersey’s Long Beach Island (LBI for those in the know) has been serving beachgoers (shore-goers?) since 1948. From May to October just a few blocks from the ocean you can sit at the wooden counter and get a taste of an earlier era with some modern updates.  Glenn Warfield (only the 3rd owner since the 40s) decided when he and his wife purchased the place in the 1980s that they didn’t want to change much. So the original menu has items like tomato aspic listed, but there’s a modern burgers/dogs menu as well. You just KNOW Mod Betty feels obligated to taste the tomato aspic salad the next time she’s visiting. 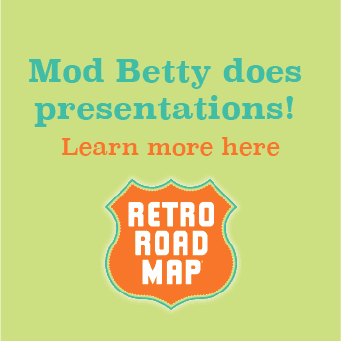 Ah, what I do for my dear Retro Roadmappers! Luckily if the aspic isn’t my pick (see what I did there) I can reward myself with a delicious dessert, because BOY do they have a lot of them all displayed in the center, to remind you throughout your meal of their deliciousness. 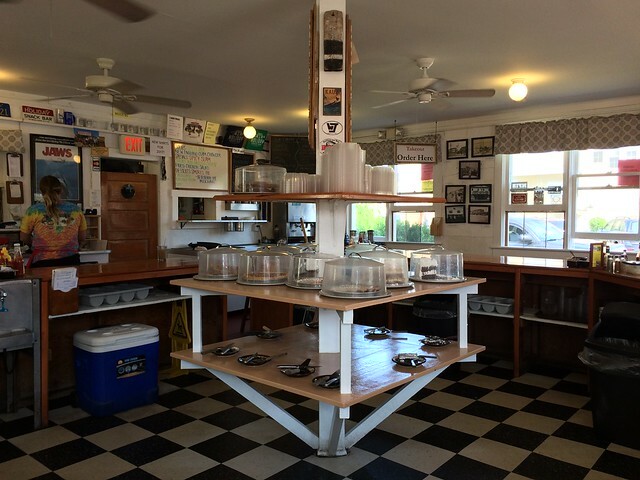 Again harkening back to an earlier era, you’ll get your choice of any number of pies and cakes that are made fresh daily on premises. I simply swooned at the tart and creamy key lime pie slice I had, and can’t wait to share their famous Lady Lord Baltimore cake with my food writer friend, so she can explore the history behind this delicious dessert. Burgers are ground fresh onsite with patties made using antique equipment, and they’re fried on a little corner griddle that has been there for decades. On the modern side, they DO take credit cards (tho be a good Retro Roadmapper, pay cash/tip heavy) and there’s outdoor tables and chairs if you want to catch that salty ocean breeze. 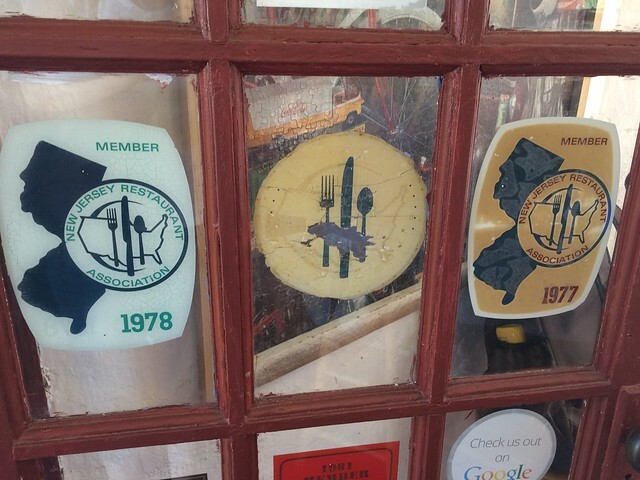 Want to visit more cool vintage places in South Jersey like this? 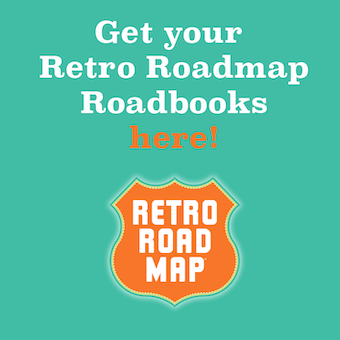 Get your Retro Roadmap Roadbook of South Jersey in the shop, today!